SOUSA, Brazil, Aug 9 2018 (IPS) - Sousa, a municipality of 70,000 people in the west of Paraíba, the state in Brazil most threatened by desertification, has become the country’s capital of solar energy, with a Catholic church, various businesses, households and even a cemetery generating solar power. 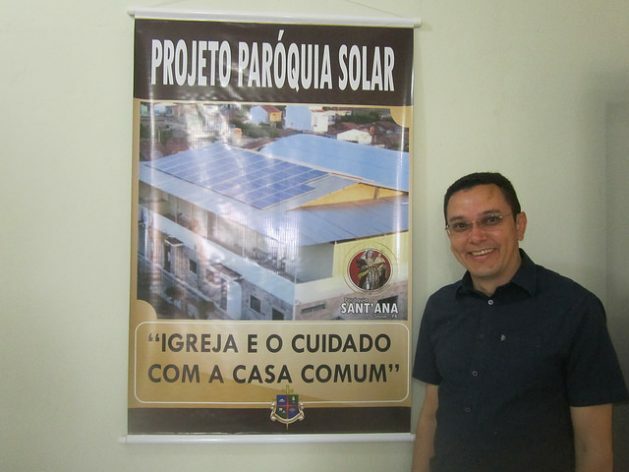 “We were paying about 4,000 reais (1,070 dollars) a month for electricity and that cost fell to about 300 reais (80 dollars),” Catholic priest Paulo Diniz Ferreira, in charge of the Sant’Ana Parish of Sousa, now nicknamed “Solar Parish,” told IPS. The parish’s solar energy generating system was formally inaugurated on Jul. 6, but had been in operation since April. The 142 photovoltaic panels installed on the roof of the Parish Centre, which includes offices, auditoriums and an indoor sports arena, also generate energy for the church, which is currently undergoing expansion work, for a chapel and for the living quarters. The installed maximum capacity is 46.1 kW and its monthly generation is estimated at around 6,700 kWh. With the new resources, the parish will be able to enhance evangelisation work and pastoral care for children, the elderly and prisoners, he said. Their example is expected to inspire the other 60 parishes that make up the diocese based in the neighbouring city of Cajazeiras, says César Nóbrega, coordinator of the Semi-Arid Renewable Energy Committee (CERSA), which promotes the use of solar energy and other alternative sources in and around Sousa, a large municipality with an 80 percent urban population. 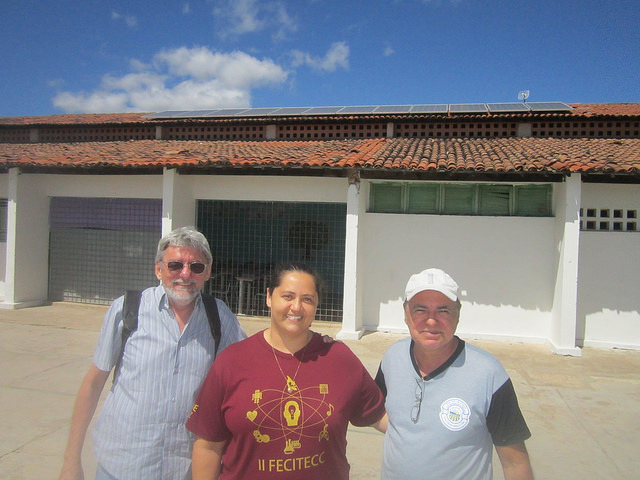 The first solar-powered school in Paraíba was inaugurated on the same day, Jul. 6. Twelve solar panels will save 350 to 400 kWh per month for the Dione Diniz primary and secondary school, in a rural district of Sousa, São Gonçalo, Brazil, which is the area with the highest level of solar radiation in Brazil and the second in the world, Nóbrega told IPS. The aim is also to “disseminate information and promote discussions with teachers, students and the local community about the solar potential in mitigating climate change,” he said. “We included it in the school’s Pedagogical Intervention Project, which chooses a theme for each two-month period, with renewable energy as its flagship,” said Clemilson Lacerda, the school’s science teacher. “We don’t yet know how much we will save on the electricity bill, which reached 1,700 reais (450 dollars) in June, but we will invest the savings in improving the school, in teaching materials and in food for the students,” school vice principal Analucia Casimiro told IPS. From the small rooftop terrace of the Vó Ita Hotel you can see the solar energy boom in Sousa. The rooftop of the hotel itself is covered with photovoltaic panels, as well as two large rooftops below, of a gas station and a steakhouse. Nearby there are industrial warehouses, houses, stores, pharmacies, car dealerships and supermarkets which are also using the new source of energy, as well as companies that consume a lot of energy, such as cold storage warehouses and ice-cream parlours. “I reduced my energy costs to zero,” young entrepreneur Paulo Gadelha, a partner in a company that has a poultry slaughterhouse, farm, dairy products factory and store, told IPS. It generates its own electricity with 60 solar panels placed over the truck parking lot at its slaughterhouse. 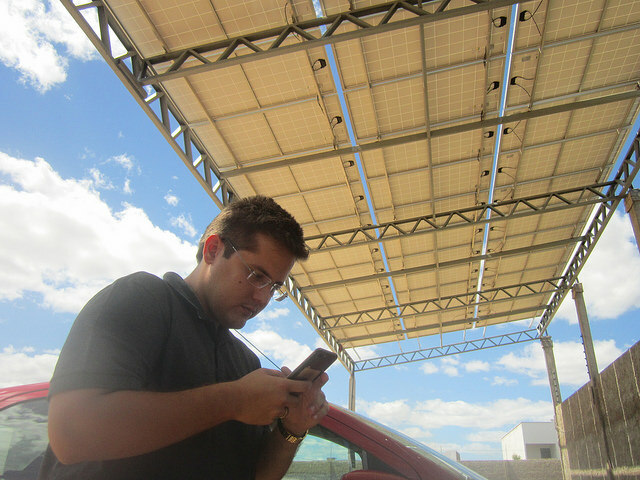 “In 2014, when we founded CERSA, there was not a single solar energy system in Sousa; today we have more than 100 installed,” said Nóbrega, the head of the organisation, which brings together public and private institutions, researchers and collaborators, with the mission of making “solar power the main source of energy” in Brazil’s semi-arid Northeast. This activism, rooted in the fight against climate change that tends to aggravate local drought, succeeded in mobilising many stakeholders from universities, civil society and the public sector in seminars, forums and courses. “CERSA was not born to install generation systems, but to debate,” raise awareness and encourage public policies, Nóbrega said. But in practice it also acts as a disseminator of solar plants on two fronts: corporate and social. It stimulated the creation in 2015 of Ative Energy, the largest installer of photovoltaic systems in Sousa and executor of the Solar Parish project, conceived by CERSA. Today there are five solar power companies in the city. “By November 2017 we had installed 40 systems; now there are 196. We used to employ only five workers, now there are 30: we grew sixfold in six months,” said Frank Araujo, owner of Ative, whose operations spread over 26 cities in five states of the Brazilian Northeast. In Brazil, solar generation represents only 0.8 percent of current installed capacity, but it is the fastest growing source of energy. According to the National Electric Energy Agency (ANEEL), the sector’s regulatory body, it accounts for 8.26 percent of the energy in new construction projects. Danilo Gadelha, one of the leading members of Sousa’s business community, is a co-owner of Ative and also its main client. He hired the company to install solar power plants in the companies of his conglomerate Vó Ita, comprising distributors of food and cooking gas, a vegetable oil factory, a hotel, a construction company, a gas station and a cemetery. “I started trying solar energy as a user,” before offering it as an installer and “going from a large-scale energy consumer to an entrepreneur,” he told IPS. The company’s energy costs are close to 23,500 dollars a month. Ative Energy has a major competitive advantage. As it has a great amount of capital, it finances the solar plants it installs at the lowest interest rates on the market. This is what it did with the Parish of Sousa, which is paying off the financing in monthly installments lower than the amount saved in the electricity bill. “We will repay everything in three and a half years,” said the parish priest, because little more than a third of the project was paid for in cash with donations. Since the equipment has a 25-year life span, the church will have free energy for more than 20 years. The solar energy units in companies and large houses are important for the CERSA campaign as a demonstration of solar power’s viability and economic and environmental benefits, acknowledged Nóbrega. But the campaign also succeeded in attracting the interest of funds and institutions that support social projects. Thus, in 2016, the Solar Semi-Arid Project was born, made up of CERSA, Caritas Brazil – the social body of the Catholic Bishops’ Conference – and the Forum on Climate Change and Justice, with financial support from Misereor, the development aid body of the German Catholic Church. This allowed the Dione Diniz School to obtain its solar plant, financed part of the Solar Parish system, and distributed water pumping devices and biodigesters in rural communities, as well as making it possible to offer training courses for “solar electricians” in Sousa and nearby municipalities. 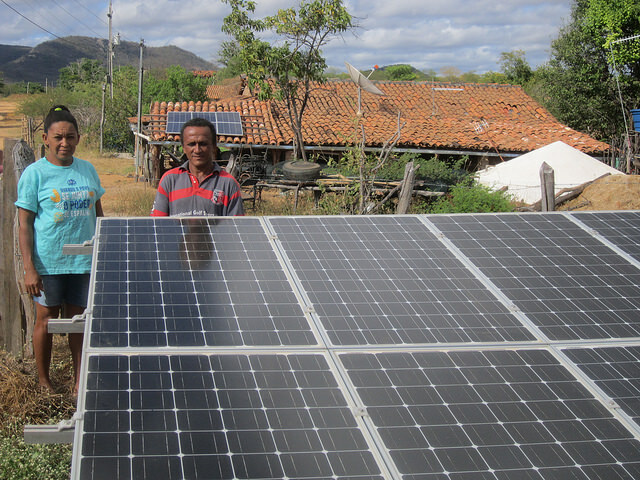 In addition to providing cheap and clean energy, decentralised photovoltaic generation is an economic alternative for Brazil’s semi-arid Northeast which is at risk of becoming completely arid due to climate change, warned Nóbrega. In the state of Paraíba – where Sousa is located – 93.7 percent of the territory is in the process of desertification, according to the Programme to Combat Desertification and Mitigate the Effects of Drought in that northeastern Brazilian state.